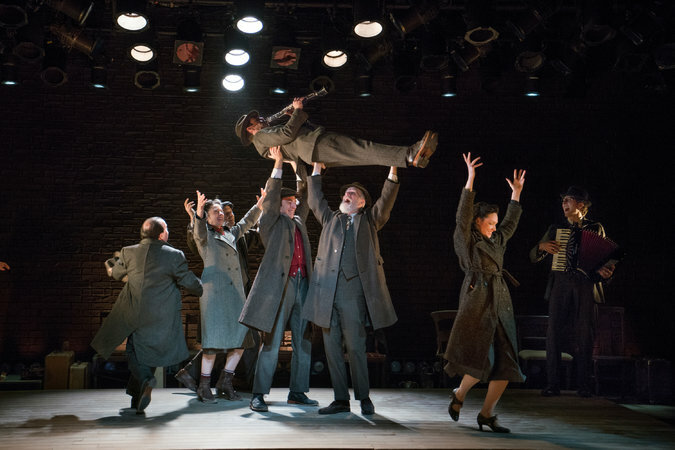 The protagonist of “Indecent,” the powerful new play by Paula Vogel, is not a person but a drama — meaning that this is a play as much about the fate of a play as it is about the lives of the people involved in it. This superbly realized production, created by Ms. Vogel and the director Rebecca Taichman, charts the tumultuous fortunes of “God of Vengeance,” a work by Sholem Asch that caused a scandal when it was produced on Broadway in 1923. 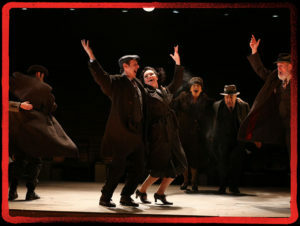 In many respects, “Indecent,” which opened at the Vineyard Theater on Tuesday, could be seen as a Jewish version of the current “Shuffle Along, or the Making of the Musical Sensation of 1921 and All That Followed,” another terrific show about a landmark Broadway production (almost) lost to history. Thanks in no small measure to Ms. Taichman’s sensitive direction and the forceful performances of its cast — all of the actors play several roles — “Indecent” sheds an eye-opening light on a little-known time when theatrical history, Jewish culture and the frank depiction of homosexuality intersected, with explosive results. It begins with the arresting image of the cast, clad in drably colored clothing from which ashes fall in thin streams, rising from chairs at the back of the stage and stepping onto a simple wooden platform. This strange vision comes to have haunting significance as the play moves to its dark conclusion. But at first there is excitement. In their Warsaw apartment in 1906, Sholem (Max Gordon Moore) is reading the play to his wife, Madje (Adina Verson). Her enthusiasm is as much philosophical as personal. She believes that the play captures much about the Jewish culture of the times that needs to be brought into the light: “The roots of all evil: the money, the subjugation of women, the false piety … the terrifying violence of that father,” she says, referring to the central character, a Jewish patriarch, Yekel, who runs a brothel from his basement. Most of all, she’s touched by a scene in which two young women, the virgin daughter of Yekel and one of the prostitutes who work for him, discover their love for each other during a rainstorm. Snippets from this scene and another from the original play will unfold before us at various points in “Indecent,” and even seen in small doses, they retain a remarkable power. The encounter between the two women — portrayed, in their characters as actors, by Ms. Verson and Katrina Lenk — has a tender poetry that clutches the heart more than a century later. At a reading at a literary salon, the reaction is not universally laudatory. “You are pouring petrol on the flames of anti-Semitism,” fumes one participant, outraged at the depiction of Jews as “pimps and prostitutes.” This will turn out to be an accusation that dogs the play, even as it finds initial success. Others are more impressed. Lemml, played with gentle ardor by Richard Topol, is a tailor from a shtetl. Entranced by the play, he becomes the stage manager when it is produced in Berlin, with the famed actor Rudolph Schildkraut (Tom Nelis) starring. “Indecent” makes deft use of projections to indicate whether the language being spoken is English or German or Yiddish, or when a “blink in time” occurs, and the action fast-forwards. It may sound complicated, but as engineered by Ms. Taichman, these transitions are always bell-clear. 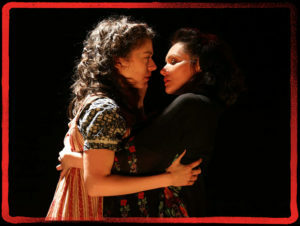 Despite the complex plot, “Indecent” has been shaped by its creators with unusual finesse, using techniques associated with Brecht. Occasionally interrupting the narrative are klezmer-flavored songs and music by Lisa Gutkin and Aaron Halva, who play instruments and are active participants in the action. The fluent choreography, by David Dorfman, also contributes to the almost cinematic flow. When, after making a splash in several European cities, “God of Vengeance” comes to New York, it is initially successful when first presented in Yiddish. The trouble comes when the commercial theater beckons. The producer Harry Weinberger (Steven Rattazzi) decides to present an English translation at the Provincetown Playhouse that eliminates the lesbian love subplot, to the dismay of Dorothee (Ms. Lenk), who now plays the role of the prostitute, and other cast members who have lived with the play and its characters in their hearts. “God of Vengeance” then moves to Broadway, and under the glare of the attention it receives, comes under fire from both the arbiters of Jewish culture in the city and the authorities, who arrest the cast and producer on charges of obscenity. 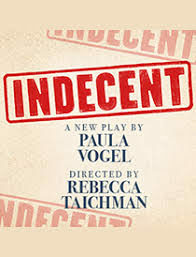 “Indecent” becomes diffuse as Ms. Vogel’s plot grows more complicated, following the fate of the play and its performers, as well as the experience of Asch, who falls into a depression after a return visit to Europe, during which he witnesses alarming signs of rising anti-Semitism. He and Madje eventually move to Staten Island, where he concentrates on writing novels. In “Indecent,” the fate of “God of Vengeance” doesn’t end with the scandal surrounding the trial. Among the many productions we see re-enacted, the most disturbing occurs later, in Poland, when the Jewish community in the Lodz ghetto is facing the impending horror of the Holocaust. With Lemml still acting as stage manager, the actors use makeshift props and perform in an attic, since a public presentation would be unthinkable. What follows? The rain falls, the two lovers embrace, but we never get to see a scene from the last act again. A theater review on Wednesday about “Indecent,” at the Vineyard Theater in Manhattan, referred incorrectly to the character Lemml. He is the cousin of a character named Nakhmen, not a cousin of Sholem Asch.